What is your job role at Pali? Search Administrator. How long have you worked at Pali? 8 Months. 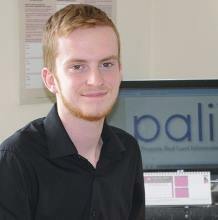 What is the best thing about working for Pali? Tackling the endless challenges which pop up, and the sense of achievement after going the extra mile for clients. What is your favourite film? Tough one, but I’ll have to go for Saving Private Ryan. Do you have any phobias? Dying. What is your favourite food? Any Mexican Food, oh and home cut Chips! If you could live in any country, which one would you choose? Probably Spain, as long as I had a constant supply of Factor 50! What would you say are your best qualities? Honesty, My Attention to Detail and Logicality. What has been the best part of your life so far? The past 2 years with my Girlfriend Heather (Oh and the small matter of Wigan Athletic winning the FA Cup last year!). Marmite – love or hate? Never tried it, never will!